Successfully Added Huawei Mate 9 Porsche Smartphone - Android 7.0, Octa-Core CPU, 6GB RAM, 20MP Dual-Camera, 2560x1440p, Dual-IMEI, 4G to your Shopping Cart. Inspired by their everlasting passion for performance, Huawei has introduced the world to their latest premium phone - the Huawei Mate 9 Porsche. 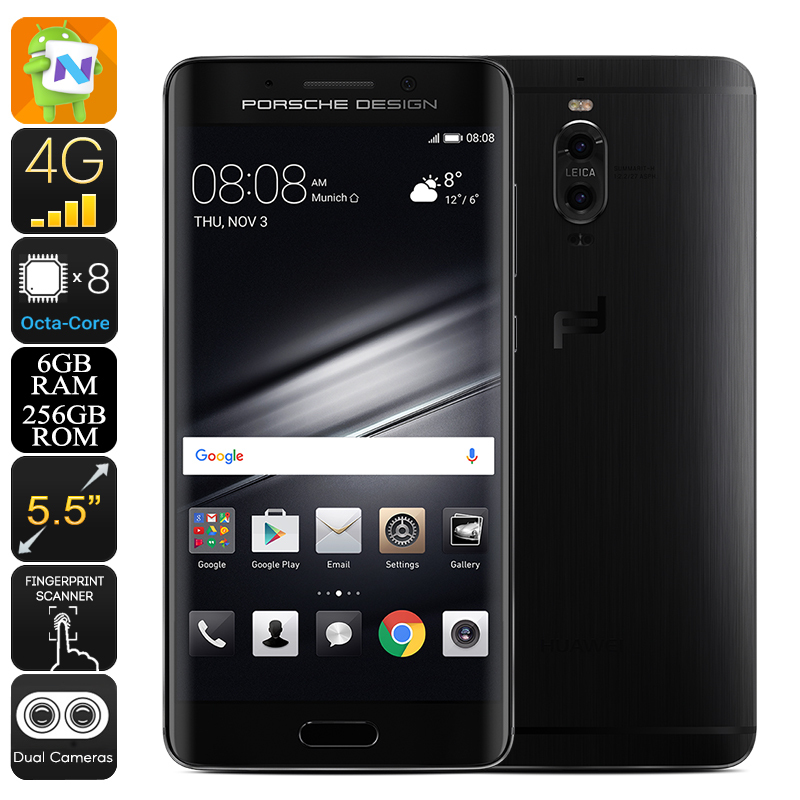 Featuring a sleek and stylish Porsche design, this full-black smartphone certainly is a feast to the eye. The Porsche design Huawei Mate 9 comes packed with state-of-the art technology – allowing it to bring forth an extremely powerful and ultra-fast performance just as a Porsche car itself. With its high-end specs and stunning desigh, this Android phone truly is a luxury high-performance device that is fits the style of anybody that likes to push life to the limit. With its Octa-Core CPU that has been clocked at 2.4GHz along with 6GB of RAM, an exceptionally fast and powerful performance will be delivered any time you turn on this Android device. Whether you like to enjoy demanding games, Full-HD movies, the latest mobile Apps, or simply like to browse the web – this premium phone is sure to meet all your demands. Additionally, it brings along great multitasking possibilities, allowing you to enjoy numerous of its high-end features at the same time without ever slowing down your Android 7.0 smartphone. With a stunning 256GB of internal storage and a second 256GB external storage option, you will have access to an unlimited pool or memory – guarantying that there always will be enough space for you to safe your latest files and media alike. As a true premium phone, the Huawei Mate 9 Porsche delivers astonishing connectivity. 4G network support lets you enjoy the fastest mobile data speeds out there, letting you browse the web at lightning speeds no matter where you’re at. The phone furthermore supports Dual-IMEI numbers, letting you be reachable on two phone number simultaneously – making it perfect for separating your work and private life while using merely one high-end Android device. Coming with an epic 4000mAh battery, this mobile phone delivers up to 30 hours of continuous usage time. From now on you’ll be able to get through multiple demanding smartphone days without ever again needing to worry about running out of juice. Packed within its premium body lays a mesmerizing 5.5-Inch AMOLED display that portraits all your favorite media in a whopping 2560x1440 (WQHD) resolution. On the rear of this stunning Android phone you’ll furthermore be able to find a mind blowing 20MP dual-camera with which you’ll be able to shoot breathtaking photographs and ultra-HD video at any given moment. No matter where you’ll be heading next, with this Android phone at your side, you’ll have all the means necessary to snap the perfect pictures of all those special upcoming moments in life. The Huawei Mate 9 Porsche comes with a 12 months warranty, brought to you by the leader in electronic devices as well as wholesale electronic gadgets..
Google Play store is not installed on this phone. Arabic: - الروبوت الذكي - Chinese Simplified: - Android 智能手机 - Czech: - Smartphone se systémem Android - Danish: - Android Smartphone - Dutch: - Android-Smartphone - French: - Smartphone Android - German: - Android Smartphone - Hebrew: - הטלפון החכם אנדרואיד - Hindi: - एंड्रॉयड स्मार्टफोन - Italian: - Smartphone Android - Japanese: - Android スマート フォン - Korean: - 안 드 로이드 스마트폰 - Malay: - PINTAR telefon Android - Norwegian Bokmål: - Android Smartphone - Romanian: - Un Smartphone Android - Russian: - Android смартфон - Spanish: - Smartphone Android - Thai: - สมาร์ทโฟน android - Turkish: - Android Smartphone - Vietnamese: - Điện thoại thông minh Android.